Old Long Island: Old Long Island Turns 6! Old Long Island Turns 6! Today marks the sixth anniversary of the creation of Old Long Island. Coming in three days short of the 1,700th post, up to now there have been over 450 estates/residences featured, over ten thousand photos uploaded, over 450,000 visitors and almost 2.9 million page views. It's about now that I usually remark that I hope to have enough material to keep going for another so many years... but I am honestly amazed it has lasted this long. When adjusted for visitors who came and left immediately (the 'bounce rate'), Old Long Island has had over 200,000 people spend an average of over 7 minutes on the site during the last six years. As I said last year, my plan is to continue to post something new for as long as I possess something new. Thank you to everyone who visits frequently, infrequently, likes to comment or stay silent, has sent me an email or something to post...I couldn't have gotten it this far without all the help. 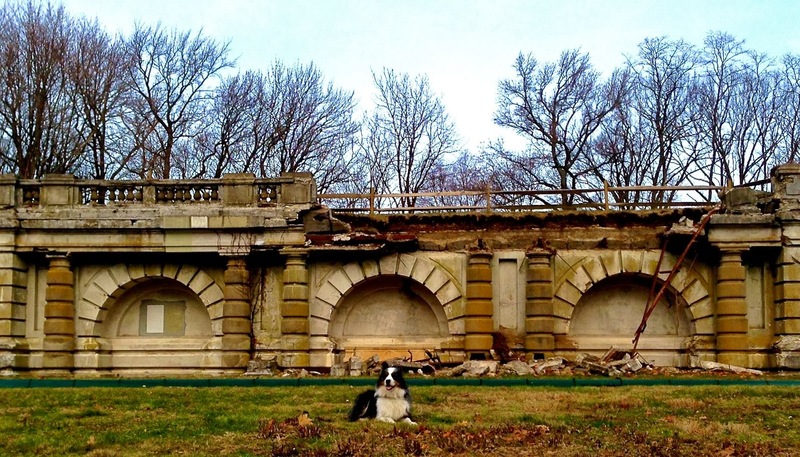 Above, my dog Otto sitting in front of the now badly damaged garden wall at 'Spring Hill', the Henry Carnegie Phipps estate in Old Westbury. Merry Christmas everyone! Happy 6th Anniversary ~ and Merry Christmas Zach !!! Good to see Otto, again, and off-leash !!! Thank you for all you do for all of us!!! How do you only spend 7 minutes on here?! I come to check for a new post and end up following the click here links for most of the day. Congratulations. Six years, I guess that means you’re going to take a rest next year. Got my hands on a copy of "Preserving American Mansions and Estates" by Shopsin. Interesting read. I’m at the part that deals with preserving the gardens of great estates, which fits in with todays blog. Another sad case of a garden destroyed is Doris Duke’s. There is a difference between an older house abandon to time and nature and the destruction of a great garden. Can you recommend any other books? I comment infrequently but visit your site daily. It is a terrific venue for those interested in long island history and, sadly, more recently, cultural destruction. Thanks for all of the work on your part. Clearly, a labor of love. Happy we are that you keep on. Tea and OLI every morning here. I agree with Anon 8:30AM -- who can stay here for only 7 minutes? I spend more time than that just rotating the Bing map if there is one. Zach, you'll never know exactly how much good your web-site has done but I have no doubt that somewhere (maybe not even on Long Island), a house has been saved because you inspired someone to save it. Otto looks a hell of a lot better than what's left of that wall. Don't forget that 7 minutes is the average of 200,000 people. Some stay for 30 seconds and some for 30 minutes. I've even seen some stay for 4-5 hours (though I do wonder if they just left their browser open to OLI and went to do something else). Congratulations and Thank You!! I look forward to OLI every day and appreciate your steadfast commitment. And thanks to all your regular commenters too (you know who you are). Merry Christmas to all! Thank you for all your efforts for the blog, Zach and Merry Christmas to you and yours. I visit the site daily and enjoy it immensely. It is a very nice thing for a former Locust Valley guy to be able to visit such familiar surroundings. Hello Zach, Six years is an impressive achievement, a testimony not only to your hard work, but also to the incredible architectural history of Long Island. We are looking forward to many more years of your research, but in the meantime have a great Holiday season. Happy 'Birthday' AND Merry Christmas! Thank you and Otto for all your hard work. Old Long Island has given me so many hours of enjoyment. Thank you for what has become my passion. Merry Christmas! Happy Anniversary! I check your site everyday, and enjoy it enormously. Thank you for providing quick access to so much wonderful information and great photos! All the best for the new year! And a Very Merry Christmas to you too. I start my day every day looking at your site ...its so interesting and well done! Thank You! I want to thank you for a most interesting blog that will continue to enjoy in the future. Thank you Zach! Your blog introduced me to so many new interests, and I've picked up new hobbies and passions along the way. Keep evolving! Thanks, Zach, for this site as it is a wonderful reference and is very meaningful for us history buffs on a world which is no longer. We know the amount of effort it takes to produce your information and is very greatly appreciated! Hats off to you and happy holidays from Newport. Congratulations Zach..you provide me with something I totally enjoy. I deeply appreciate your phenomenal effort.Happy New Year. Look forward to this site every morning. Congratulations, thanks and Happy New Year. Always enjoy the site -- guilty of keeping it open, both at home & work, so I can check for updates/comments anytime. A day without OLI is a day without history! "...I just learned that the Brady's famed Long Island mansion "Inisfada", on which you did a marvelous posting not long ago, is being demolished, all efforts to save it having been exhausted..."
Late to the party as I'm in Barbados for the Holiday - Zach, congrats on the Anniversary and here is to continued success! p.s. Otto looks to be enjoying the venue.